Every time you turn on the news, you see a different possibility for how the world might end—and imminently! Climate change, Ebola, asteroid impact, nuclear war … zombie apocalypse. How will you prepare? How will you save your family? How will you help save the world for your children and future generations? Obviously, the best preparation is to read up on every possible disaster scenario. And a great way to start is with the Disasters Storybundle, which just launched at storybundle.com. I have just curated a new bundle of 11 epic disaster novels that cover the gamut of What Can Go Wrong. Think of it as 50 Shades of Doom. But these aren’t just tales of disaster…but tales of heroism, persistence, ingenuity, and survival. These are truly the best things to read while you’re huddled underground in your bomb shelter (or just in your living room, in the meantime). The New York Times bestseller FIRE by Alan Rodgers has it all, the brink of nuclear war, religious fanatics taking over the country, a mysterious virus that raises the dead… ATLANTIS by Bob Mayer takes you to the Bermuda Triangle and the fate that destroyed Atlantis may be moving on the rest of the world. In STORM WORLD by New York Times bestseller Brian Herbert and Bruce Tayler, a group of survivors after a global climate catastrophe fight to defend the last seed bank, which holds hope for the future. David Sakmyster’s FINAL SOLSTICE has a different explanation for disastrous climate change—Druids! Bill Ransom’s VIRAVAX and Laura Anne Gilman’s DRAGON VIRUS both tell of species-altering genetic plagues…but in dramatically different fashion. Brian Herbert and Jan Herbert turn to the seas, where the lifeforms of the ocean finally rebel and turn against the land dwellers after centuries of destruction and pollution. My novel ILL WIND with Doug Beason is about a gigantic oil spill in the San Francisco Bay…and efforts to mitigate it release an oil-eating virus that brings about the fall of civilization. Hugh Howey and John Joseph Adams have covered it ALL in their anthology THE END IS NIGH, with stories about every kind of end-of-the-world imaginable. THE HIGH EDGE by Dean Wesley Smith, a novel in his popular Seeders universe, describes a huge population die-off, and the survivors who must reach for the stars. And SEEDS by Chris Mandeville takes place half a century after a catastrophic solar event destroys life and technology on Earth’s surface, and it is now time for the underground survivors to emerge. At storybundle.com, you pay whatever you feel the books are worth and you’ll get the six basic books. If you pay above $15 you get the original six books, plus five more. That’s only a little more than a dollar per book! The bulk of the earnings goes *directly* to the authors, with a portion also going to charity—the Challenger Centers for Space Science Education, in this case. Available in all eBook formats. But this bundle is available for only a limited time—don’t miss the disaster! 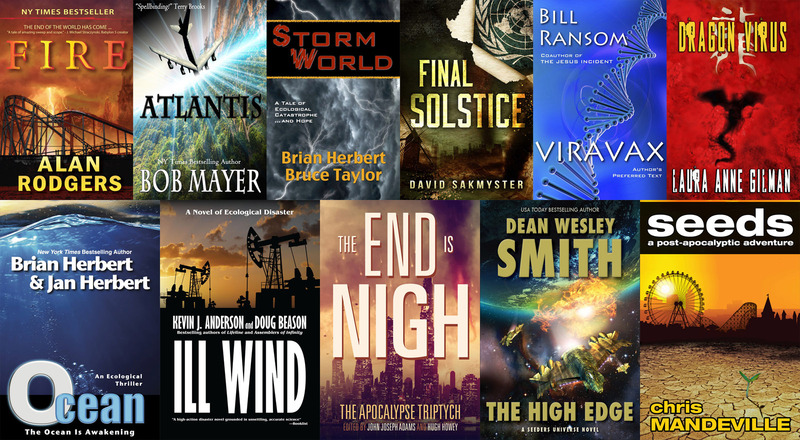 If that sounds good, head over to StoryBundle.com and pay-what-you-want for the bundle and get lots of great disaster fiction for an affordable price.